Lift and lower heavy objects with ease. Easy foot pedal operation of hydraulic lift. Removeable handle for easy storage. Locking casters for secure loading and unloading. 2 swivel and 2 rigid casters for easy maneuvering. Lift Range on 300 lb capacity - 8.25 to 28.75 inches. Lift Range on 1650 lb capacity - 16.125 to 39.25 inches. 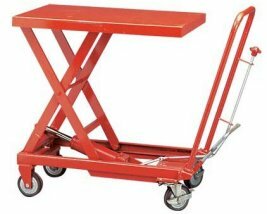 The GP300-H Lift Table Cart is ideal for lifting cargo and items with ease. Lift and lower heavy loads for smooth, easy loading and unloading! 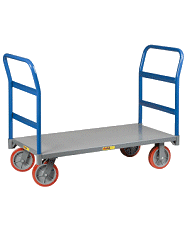 Ideal for transporting shop machinery, large tool boxes and cargo too heavy to lift manually. Additional uses: Loading and unloading cargo from vehicles. Stocking shelves without any bending. Work on engines or other machines at a comfortable and convenient position. Many professional have come to depends on the GP1650 for the solid state construction and high quality performance. I have a son that is 38 and weighs over 200 lbs. He is handicapped and falls once in a while. I am 66 and can no longer lift him off the floor any more. I bought this to get him up off the floor with. I position it behind him and he puts his hands behind his back and lifts himself part of the way onto it. I pull and guide him the rest of the way. Then I can lift him with the table to a sitting position close to hand rails I have installed on the walls in the house. From there he can pul himself to a standing position while I get his wheelchair. It worked great yesterday when it came time to use it.